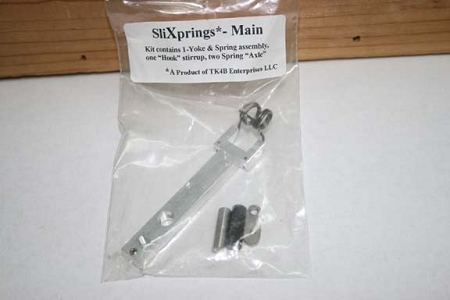 TK4B Enterprises, makers of “SliXprings” and “SliXpins”, has produced a newly designed “SliXpring-Main” replacement Mainspring system that is designed to complement an already properly tuned and short stroked Winchester style 1873 rifle or carbine. Its sole purpose is to provide a faster lock time (faster, more positive hammer travel), a more dependable primer strike and a more durable, longer lasting, smoother cycling competition grade spring operation. It, in most cases, will feel a bit more brisk in the initial cocking action of your rifle, but be assured it will respond much more smoothly throughout the hammer cycle than a normal leaf style spring, plus it is at least 30% faster than your competitively adjusted leaf spring. The “SliXpring-Main” kit requires competent installation with minimal stock fitting and is completely reversible to your existing arrangement.